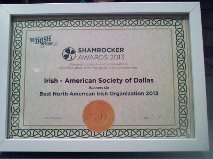 During a recent survey conducted by Gifts Online, the IAS Dallas organization received a Shamrocker runner-up award as the best North American Irish organization. 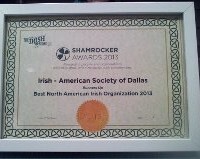 You may see this and a previous award at Trinity Hall Pub. To find out more about the Irish Store, click on the link. This entry was posted in News & Announcements, Uncategorized. Bookmark the permalink.